Meet ‘Butterfly’ The Geep – Half Goat, Half Sheep, All ADORABLE! Have a look at her for yourself! Previous articleI Thought It Was Just a Beat-Up Truck… But When It Opens Up? I Was Gobsmacked! 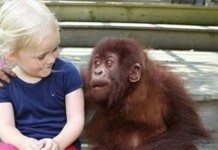 She Grows Up With Gorillas… But 12 Years Later When They’re Reunited? I’m Speechless! 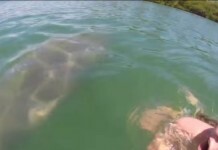 She’s Just Having a Quiet Swim Until She Sees THIS! He Set Up His Camera On The Side Of The Road… What He Captured Will TERRIFY You!